This shirt is the player issue authentic version which means it comes with the heat sealed ventilation holes to the sides and is better fitted. Usually I'm not a fan of Kappa shirts due to their tight fitting style, however the player issue version has a slightly better feel to it which counters the tight fit of the shirt. The shirt is fairly plain in design and the colours don't particularly take my fancy. Something simple like making the bottom hem line blue to match would have made this shirt better in my opinion. The twinning between supporters of the clubs Napoli and Genoa football club is one of the oldest in Italian football. It began on 16 May 1982 following a 2–2 draw in Naples between the two teams on the final day of the 1981–82 Serie A season, a result that allowed Genoa's escape from relegation and condemned Milan to relegation from Serie A to Serie B for the second time in its history. The history and friendship got even stronger for both teams when on the last day of the 2006–07 Serie B season, when both teams drew 0–0 draw at Genoa, ensuring both teams' promotion to Serie A. Genoa ultras could be seen holding up banners saying, "Benvenuto fratello napoletano," meaning, "Welcome, Neapolitan brother." The historic partnership between the two groups of supporters was also honoured and supported by marketing initiatives. 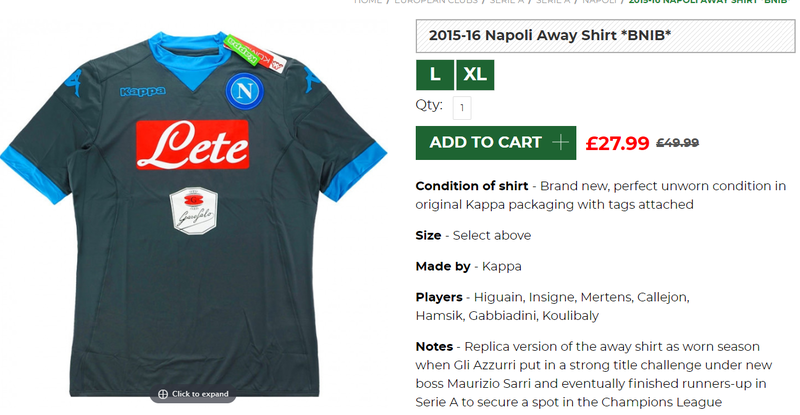 If the above has given you some inspiration to buy a Napoli shirt then why not buy one of theirs from this season. Clicking on the photo will take you to the retailer.